I got the email below this month. I consider it spam because I did not subscribe to it so it’s unsolicited = SPAM. I am just not sure whether I will be annoyed or flattered. Annoyed because spam mails are annoying (that’s why I blog and tag them here). Flattered because it seems something is working (with the website) and it is attracting some attention with some SEO folks out there 🙂 . My name is (Name Removed) and working with a reputed leading SEO Company in INDIA having the experience of getting our customer’s websites top in Google, Yahoo, and MSN and other search engine rankings producing high revenue with top page rank. Note: We are not spammers and are against spamming of any kind. If you are not interested then you can reply with a simple “NO”,We will never contact you again. I will not reply via email. That warning/note at the footer is kinda lame and I am not biting the bait. I did not publish that email add but I guess they are resourceful (They probably got the address from whois services and that workaround make sense). 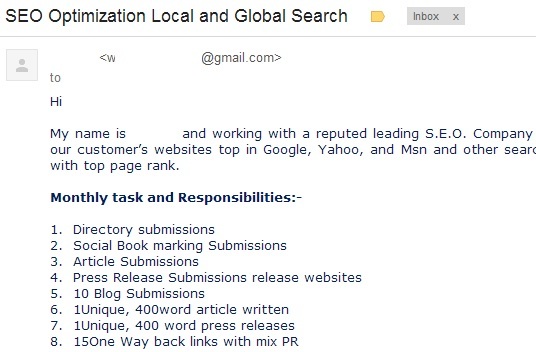 Email Subject: “SEO Optimization” Local and Global Search – Isn’t that redundant? Their services are either “basic (read: I can DIY easily)” or “tricky (read: bordering from gray hat to questionable practices)” or “fishy/phishy”. Decision: I’d rather stay on the safe side. To the sender: Don’t push it further. Else I might elevate the rating to SCAM. Do you also get interesting spam emails? How about SEO offer spam? Kindly share your experience here.